From Conservative to UKIP, from Lib Dem to Labour. So there is a massive election going on throughout Europe for the European Parliament, with the Netherlands and the United Kingdom voting Thursday, and the bulk of the continent following on Saturday. The election dynamic is an interesting one – historically the Parliament has been without much authority and thus most elections have had very low turnout. Two dynamics are at play that makes this one a bit different. The first is that since the Treaty of Lisbon, EU bodies have been gaining more authority. Thus these elections are gaining some importance, at least in terms of party prestige. The second is that in the past few years there has been a sharp increase in eurosceptic parties – a generic term for any party that opposes their country’s inclusion in the European Union. These parties are on balance, though not exclusively, conservative to far-right. 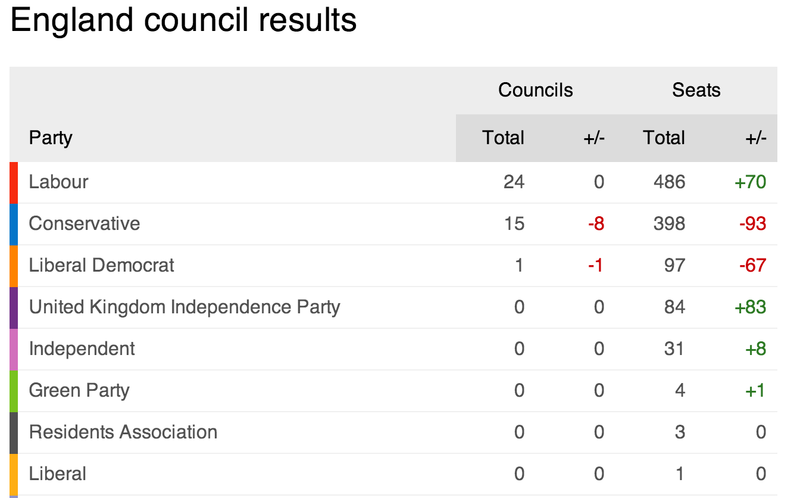 Projections indicate a rise for a coalition headed by the UK Independence Party (‘UKIP’, which is said as a word) and increasing seats for parties to the right of UKIP, like the National Front in France. The influence of these parties is also creeping into other groups. The UK Conservatives are being hounded towards a referendum on Britain in the EU, and the Greens support a referendum out of the necessity of getting it over with and focusing on other policy issues. 2) How big will UKIP’s win be, and will they win the European Parliament elections in the UK? 3) Where is UKIP getting all this support from? The second question is outstanding, though polling indicates it’s likely. The third we can start looking at thanks to this local election data. I’m going to make a theory based on the simplest look at this current data, which has been developing since returns started coming in. An issue with this is that positive results are necessarily good results. One can still underperform. However, it seems UKIP is getting their increased support from Conservatives that are either upset with the current Cameron administration, angry at the European Union, or both. It seems to me that the switch between the Liberal Democrats and Labour may also be a simple swing – people that aren’t Conservatives (which to some is a lifestyle, or a cultural taboo) but are tired of the coalition government are switching to Labour. The big loser is the UK government, the big winner are parties in the opposition. It’s something that looks familiar to any American who’s seen enough midterm elections, though this has the dynamic of a new political force entering and taking support, rather than it falling back to the traditional opposition. The EU vote will be interesting for me, since the Greens enjoyed a late poll surge and may hit 10%. Local elections are a bit more difficult (the EU is very environmentally-focused, so a Green vote makes sense), but I hope they pick up a bit of support. As an outsider it’s difficult to grasp all the subtleties – much of the UK election has been about immigration, and I’m not part of the American contingent that thinks immigration is bad or dangerous. At some level elections are always interesting. No matter what political body they are for, they can tell people, locals or foreigners, something about the country in question. Here we see two shifts, one against the incumbent regime, and another against the larger union that the United Kingdom is a key part of. Combined they benefit two different forces, namely the establishment opposition and the anti-EU front. Author Andrew MackayPosted on May 23, 2014 May 23, 2014 Categories Environment, PoliticsTags conservatives, election, England, EU, EU election, European Parliament, eurosceptic, Greens, immigration, labour, Liberal Democrats, racism, referendum, tories, UKIP, United KingdomLeave a comment on From Conservative to UKIP, from Lib Dem to Labour.